what smart-allecks have famously dubbed "the most expensive demo ever" is also the first game I bought for the PS4. For a few months now, we were only using the console as our Netflix/Hulu box. PS4s were expected to be in short supply for a while, so I picked one up as soon as I was able to find one, to ensure I could play Ground Zeroes when it dropped. Of course, there were demos and such available for PS4, but none of the games out prior to Ground Zeroes were my cup of tea, or showcased the hardware very well. As far as first impressions go, I really enjoyed this game. The most noticeable and standout part of it was the graphics. I've never been the type experience genuine awe in reaction to game graphics; the only other time I remember a feeling like that was with SSX, and maybe Half-Life 2 or Metal Gear Solid 2. The FOX engine is truly impressive; the fabric on Snake's outfit "bunches up" as he moves, every surface has a unique level of reflectivity, and character animations are strikingly lifelike. I was particularly impressed with how guards smoothly collapsed if shot while running. A morbid thing to notice, but it's still impressive animation-wise. I had seen YouTube videos of the game in action prior to playing, but they don't do it justice. We really are at a point in graphical fidelity where Flash video compression legitimately crapifies the quality. On PS4, where the fidelity is best and the action runs at 60 FPS, it is stunning. You can complete the main mission in just over 10 minutes; that much is true. My first playthrough of it, without trying to be quick about it and including continues, was about 1 hour. I'm not a fast mover but am usually pretty deliberate in open-world settings and stick to the story; I don't usually trouble myself with side-tasks or general bumming around. Like many have pointed out, though, the game does open up to other missions once you've completed the main story. They're not as cinematic and do have an air of being added in for the sake of padding, but they're definitely better than nothing. The devs also took care to make sure they all felt different, ranging from assassination to intelligence gathering to VIP protection. The VIP mission in particular got a chuckle out of me when it was revealed just who that VIP was. Ground Zeroes is a "part 1" of sorts that is meant to lead into the true game, Metal Gear Solid V: The Phantom Pain. As the game mechanics in TPP will likely be identical when it comes out, let's talk a little about how they are handled in GZ. The game is still a sneaking mission at heart, and staying out of sight is always the best option for survival. The series has returned to its roots in a way, requiring you to rely on cover to stay out of sight. The last two games in the series, MGS3 and MGS4, used camouflage mechanics. In those 2 games, depending on how well you blended in with your surroundings, the enemy would not spot you until they were practically standing on top of you. I both like and dislike that the camo mechanic is gone. In the original MGS (my favorite), you did not have camouflage and the camera was fixed in a top-down position. This gave you 360 degrees of vision around your character, and you also had the soliton radar, which displayed the position of your enemies on an always-visible map. 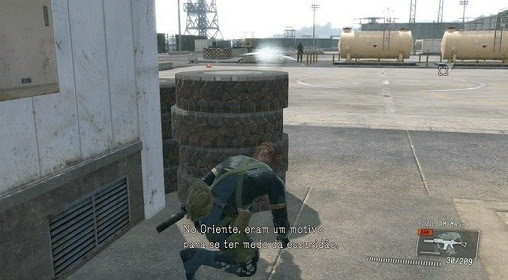 In MGS3 (the first to use camo), you did not have a persistent radar, but the camouflage mechanic gave you some breathing room, since guards would need to be close-up before they could see you. MGS5 removes the camo, but doesn't give back the radar. Your camera is a traditional 3rd person-type, that can only see the 180 degrees of space in front of it. This creates a somewhat more constrained view than I would have anticipated, and I was frustrated by just how often I kept getting spotted as a result. You can't see around obstacles very well, causing a lot of "leap of faith" movement in cases where you need to move quickly, and guards will also spot you from way-the-hell far away in this game. The game does try to compensate in several ways, with some mechanics that are new to the series. If you raise a guard's suspicion, the game will visually indicate their relative position (pic above; it's the arc shape above the tires), until the search is called off. Viewing a guard through your binoculars will also now cause them to be "marked" on your map, and you can see their silhouettes through walls from then on, too. This encourages you to scout areas before entering them, which is a welcome addition; it definitely feels infiltration-ey. There's a huge thrill that comes from laying on a hill and scouting the location for guards, before making your move down. If you are spotted, the game goes into "bullet time" for about 10 seconds, allowing you to try and shoot them (or knock them out) before they can sound the alarm. The additions all do alleviate the pain somewhat, but are solutions for after you are spotted, not tools for hiding better. In a game that derives its best tension from trying to avoid detection, it just feels a bit sloppy. Another big addition is the free-roam setting, mentioned earlier. As the preview videos had announced, Metal Gear is "going open-world". I wasn't sure what to make of this. I think that after the huge success of Grand Theft Auto 3, the genre exploded a little too quickly for its own good, and led to a lot of franchises (old and new), adopting the platform "just because". Luckily, Team Kojima is as talented as always, and just makes it work in this case. The scouting mechanic and open-world gameplay lend themselves incredibly well to infiltration. In GZ, I will comment that it is handled in a bit of a simple, straightforward manner. You are really only tasked with getting in, grabbing the prisoner, and getting out. The game would benefit from additional tasks like creating a diversion so you can enter the base, or having to locate a key to the target's prison cell. For the griping, I'm actually really pleased with this game. I think if they add more objectives when TPP comes out, this will be another great entry in the series. It's an exciting preview of what the FOX engine can do, and what this generation will shape up to be. It's pretty promising considering how early we are in the console's life cycle, and this is still an engine that can be run on PS3-gen hardware.